While the “massive manhunt” continues for a 19-year-old kid in and around Massachusetts, it’s a good idea to step back and remember that terrorism is really just a nuisance. Unfortunately, the near-hysteria that seized the country on 9/11 continues unabated, now provoked by the bombings at the Boston marathon. Post 9/11, that frenzy led to the creation of the Department of Homeland Security, the passage of the nefarious Patriot Act, the creation of the Northern Command at the Defense Department, the funneling of countless billions of dollars from the Department of Justice and other agencies to law enforcement and police departments around the nation, the setting up of intrusive “police intelligence units” in cities and even small towns, and much, much more. Now we have to wall-to-wall coverage of a small but high-profile bomb attack that killed three people and injured about 200. Horrible, yes. But it’ll pass. As John Mueller, the author of Overblown frequently points out, the chances that an American will die in a terrorist attack are about 1 in 3,500,000. Personally, I’m not worried about it. Compare that to the fact that the chance that you’ll die this year in a car accident is about 1 in 8,000. And so on. Earlier this week, I blogged about the fact that terrorism in the United States is very, very low and declining, from a high point in the 1970s to almost nothing today. Maybe the young men who carried explosives-packed pressure cookers into downtown Boston on Monday have some murky ties to terrorists in Russia or Chechnya, and maybe they don’t. Maybe Al Qaeda is involved, and maybe it isn’t. But if the sort of mini-terrorism that we saw in Boston is the best that they can do, then it’s hardly a threat of major proportions. As horrible as Monday’s attack in Boston was, the kind of mass terrorism that 9/11 seemed to herald — a wave of bombings in public places — simply hasn’t happened. There have been interrupted plots — in Times Square, on airplanes — but there had been abortive plots before 9/11, too. As political scientist John Mueller of Ohio State University is fond of pointing out, Americans are more likely to die by drowning in a bathtub than from a terrorist attack, even after Boston. What’s more worrying, to me at least, is the bubbling up of domestic, right-wing terrorist groups and individuals who might commit atrocities out of sheer hatred of government and racial bigotry. The oddball, anti-government loon who sent ricin-filled letters to the White House and to a Mississippi senator last week is the perfect example. He is probably mentally ill, but it appears that he’s harbored typically right-extremist views about government for a while. Ditto the emergence of Aryan Brotherhood of Texas and similar gangs, who may or may not have ties to the killing of a Colorado corrections official. On Wednesday, CNN, Fox News and the Associated Press erroneously reported that an arrest had been made in the case. Other outlets, including The Times, then reported what those other news outlets were saying. NBC and the New York Times did not report the faux arrest, nor did they report what others were saying. But CNN had a double dose of egg on its face when veteran reporter John King said his sources told him that the arrestee was a “dark-skinned male.” King qualified the statement as much as possible, and cautioned not to leap to conclusions, but once he uttered the phrase, the damage was done. Claims feed into stereotypes and affirm our worst prejudices. A Saudi Arabian kid running from the blast must be the suspect. A couple of swarthy backpack-toting kids watching the race must be the suspects. The New York Post promulgated both those stories. This is how hysteria starts. The hysteria started twelve years ago. 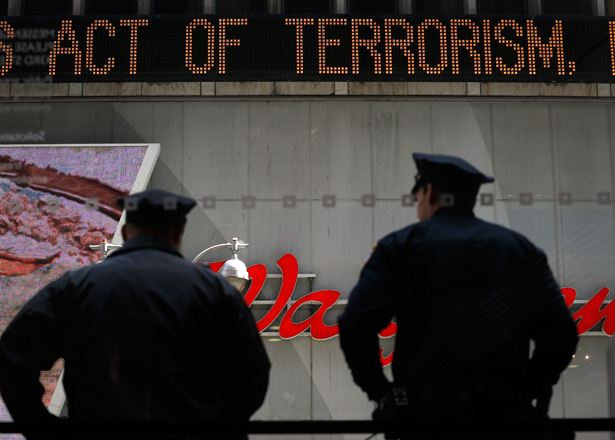 Read Robert Dreyfuss on how terrorism is actually at an all-time low.